As you heard recently, one of the earliest native plants to bloom in central Texas each year is the elbowbush, Forestiera pubescens. 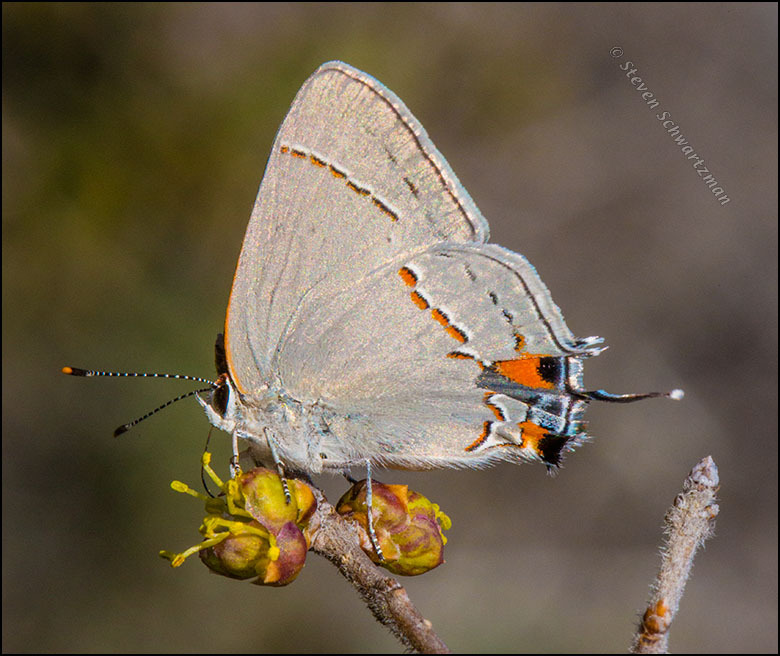 A few days ago you saw a crab spider on one at the Lady Bird Johnson Wildflower Center on February 3, 2013, and now from that same outing here’s a different visitor to an elbowbush, a gray hairstreak butterfly, Strymon melinus. I’m away from home. You’re welcome to leave comments, but please understand if I’m slow in responding. So who was the patient one … you or the butterfly or both? Beautiful, and tack sharp – just like I like ’em. Yes, hairstreaks are hard to photograph…fast little guys! And skittish. They can be skittish, but I remember that when I started doing closeups of nature in Austin, the olive hairstreaks were pretty cooperative. Hi there Melissa … thanks for following up on this comment. I stopped by Melissabluefineart’s and was intrigued by its subheading, ‘Fine Art of Ecological Restoration’. I looked around for an ‘About’ entry that I thought might explain … but couldn’t find one. Anyway, I am left wondering about the nature of your artistic focus. Oh! I didn’t realize there wasn’t anything there. Thank you for pointing that out. I’ve enjoyed visiting your blog but haven’t had time to comment before. I enjoy the intelligence of your writing. I’ll confess that I don’t remember the circumstances of taking this picture two years ago. Just as long as you approve of the results, we’re fine. Wow, just look at that gorgeous, fresh hairstreak! You can see the iridescence on his wings. Marvelous shot, Steve. Thanks, Melissa. Now if only I could iridesce as well…. Welcome to the club, Sarah. Thanks so much for taking the time to refer me to your other post–that is yet another truly amazing gift of nature to help to preserve the little guys. I am astounded that there are apparently tiny muscles in the wings that activate the decoy appendages. How cool is that?! Most people probably don’t think of gray as an appealing color (although it’s the most common one for cars, at least in the United States), so I’m glad you find it special in this case. Apparently gray with bright pops of colour is on trend for the cold season 2014-2015 though exactly where I read that I don’t know. This is a very fashion conscious butterfly. Maybe even a social butterfly. I admire the way you parlayed an awareness of fashion into a social butterfly: well done. 🙂 I must admit I was pleased with my brain for thinking up that one! Even more pleased to see a yellow admiral ( I think) butterfly in the garden for the first time. The binomial name for the yellow admiral is vanessa itea. Vanessa was a name invented by Jonathan Swift for his ‘friend’ Esther Vanhomrigh. Quite why it became associated with a butterfly I do not know. Let’s hear it for your brain! I didn’t know there’s a yellow admiral. The only one I’ve been aware of is the red. And speaking of butterflies, I saw a transplanted (transinsected?) monarch in Auckland yesterday. I’d read that people have brought them here, but I didn’t expect to see one. Linnaeus often named things after people he knew, so perhaps whoever named the genus Vanessa was paying his respects to a woman of that name. My guess is that that’s look-up-able. Sad face indeed. I imagine the paucity of butterflies in NZ is a consequence of its longstanding geographic isolation. By contrast, we have dozens of butterfly species in Austin alone. I think more and more people are coming to appreciate grey. It makes for a fabulous choice in interior design. I love grey hues with white trim. But you’re right, it’s more often under-appreciated. It seems like this butterfly is starting a fashion trend, with you as a prime mover. The antennae are very attractive on this species. The butterflies that are slow enough for me to observe closely tend to have a plain dark pair. A lovely sharp image, Steve, of a difficult to photograph butterfly. That’s a good point you make, Jane, about the patterned antennae on this hairstreak adding something extra. I’ve noticed the same patterning on the antennae of other butterflies, but I can’t remember what kinds of butterflies they were. I’ve yet to photograph a hairstreak of any species, so I am admiring this fine shot, Steve. We have many kinds of hairstreaks in Austin, so I’ve had lots of chances to take pictures over the years. Of course there are always plenty of misses when butterflies are the subjects. Let’s hope a cooperative hairstreak comes your way soon, Steve. What a lovely creature this butterfly is, with its flashings of black, orange and blue highlights. I especially like the black and white striped antenna with orange tips. Insects are so interesting to study and photograph, and they are very beautiful in their own individual ways..
And what a good news flash you’ve created about those flashings, Mary. Did you notice that there are alternating color band not only on the butterfly’s antennae but also on the lower portions of its legs? Aha! I had missed those legs. What a fashion beauty, dressed in a perfectly co-ordinated outfit. I don’t think I’d noticed them either until I was answering your comment, so I’m glad you said what you did. Alors vouz n’avez pas pu y résister.